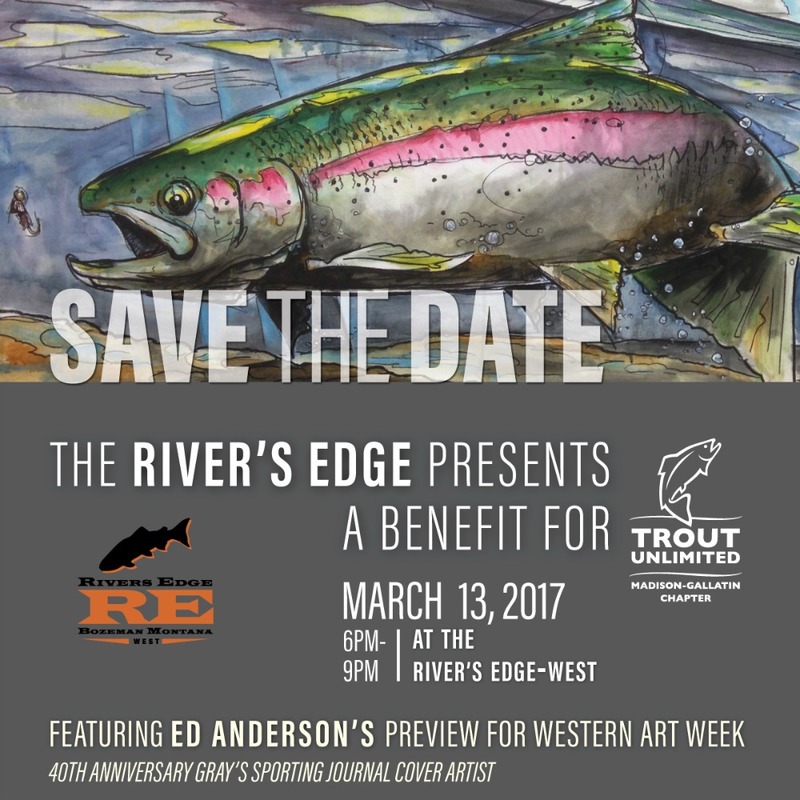 Boise-based artist Ed Anderson painting, the West, fishing. He paints. He fishes. He hunts. He travels to fish and hunt. He paints some more. That’s the life of Ed Anderson (albeit a very simplified and reductive look at it), a painter with a dash of Hemingway and a pinch of Hunter S. Thompson in his D.N.A. Both writers thought the adventure defined the man, and Ed Anderson is all about adventure. 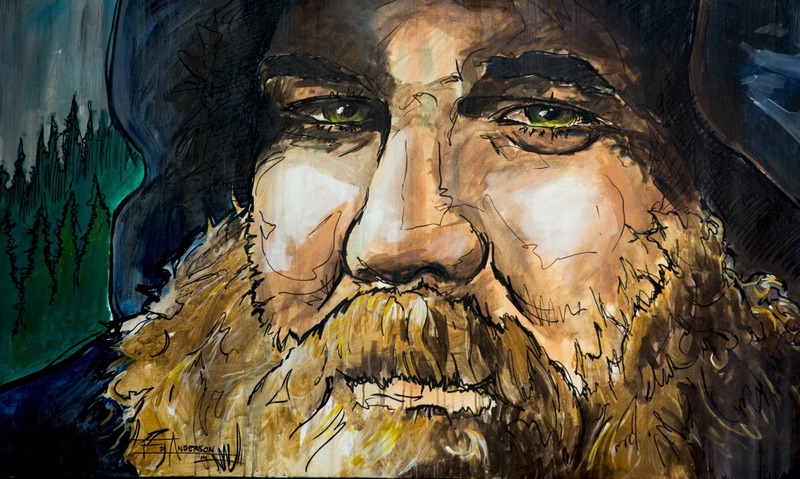 Instead of a typewriter and a bottle of whiskey, though, Ed is armed with bright-colored paints, large canvases, and the courage to paint bold lines. His subjects? The cast of characters he meets on his travels and his explorations outdoors. His paintings are full of energy—an energy derived from the passion Anderson brings to each encounter. Ask the next five people you meet on the street to define “Americana” and my money is on the bet that you’ll get five different answers. Concepts and styles that are hard to define are generally more interesting and that’s one reason why the paintings of Ed Anderson—a self-described artist of Americana—are hard to forget. An outdoorsman at heart who grew up in Minneapolis, Ed moved to the mountains of Idaho after serving as an Air Force officer. 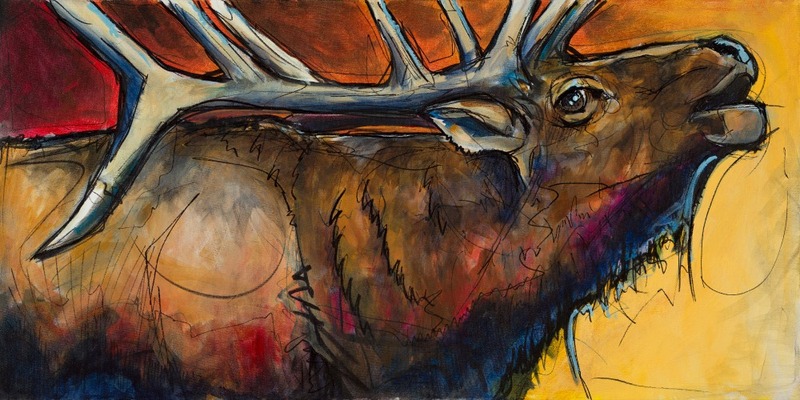 He studied architecture in college but has committed himself to fine art—painting portraits and wildlife. 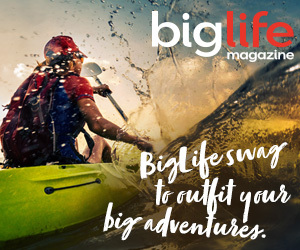 He chronicles his adventures—from fishing in Cuba “before there’s a McDonalds on every corner” to his efforts to “land a Giant Trevally” in a kayak off the waters off of Mozambique in a journal. And these journals are the foundation for his paintings. Journals are usually considered just a step in the process of that final painting, but Anderson’s journals are beautifully and thoughtfully rendered. They showcase Anderson’s ability to tell a story (an essential characteristic for a man who spends much of his time in pursuit of his next big catch!) and give you a sense of his commitment to chronicling what he calls his “investigations of America.” These investigations seem fueled by, yes, that love of adventure, but also by a curiosity and a respect for the diversity and richness of American culture. I meet with Ed over coffee in Hailey, Idaho, after he had spent the weekend finishing a painting to auction off for the Sawtooth Society’s annual fundraiser. He is on his way back to Boise, his home base, to hang with his wife (a logistics expert for the Centers for Disease Control and Prevention in Atlanta) and twin five-year-old girls. But first, he is going to head to Silver Creek to see if he can fish with his friends at Picabo Angler. We talk about the move from architecture to fine art and the leap that it was to go the art route full-time. He was, after all, an Air Force man. Rarely do people with military training jump off a cliff without triple- checking their parachutes. But for someone like Ed, joy and passion are hard to keep at bay, so Ed pursued art. 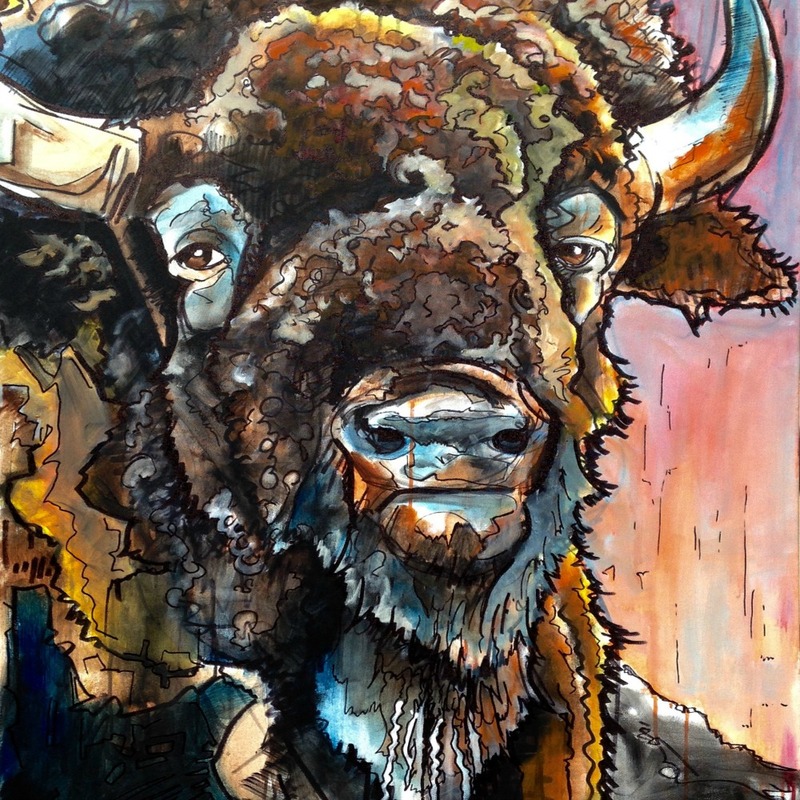 Having his art featured on the cover of notable publications like Gray’s Sporting Journal and his work commissioned by organizations like the Pro Bull Riders Association have gained him a national audience. About his process, Anderson says, “I really reverse-engineer my work—I throw a bunch of acrylic paint on a canvas with a lot of water, let it run and do its thing. Then I come back and draw a gestural sketch on it, add layers—light, shadows—and each painting grows out of that. This style, for me, is really an outgrowth of my journals.” Currently Anderson is working on a series of Americana portraits for a gallery show that will travel the West scheduled for 2018. As we pack up so that he can hit Silver Creek, Ed pulls out his Phone, complete with a cracked screen—the tell-tale sign of an active individual or a working parent—and showed me a video of him in the studio, painting, with a few guest stars—his twin daughters outfitted in t-shirts long enough to be dresses—who contributed to the painting with large bold strokes and splatters of paint. Anderson, instead of trying to micromanage where they splashed color, encouraged their exploration. It’s a theme you see throughout his work—embrace the adventure, no matter where it takes you.